RIO DE JANEIRO — One world record, one Olympic gold. That done, Almaz Ayana can start thinking about her best event. 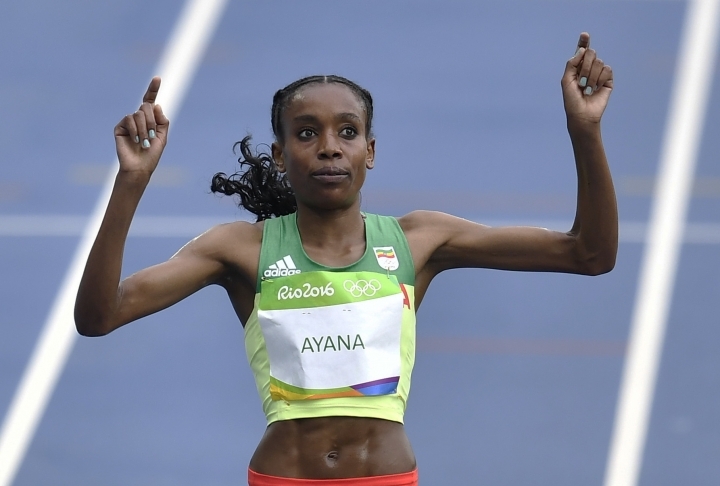 Ayana of Ethiopia delivered a stunning start to track and field at the Olympics on Friday with a world record in the 10,000 meters, wiping away the competition just after the halfway point and striding away to win with effortless grace. 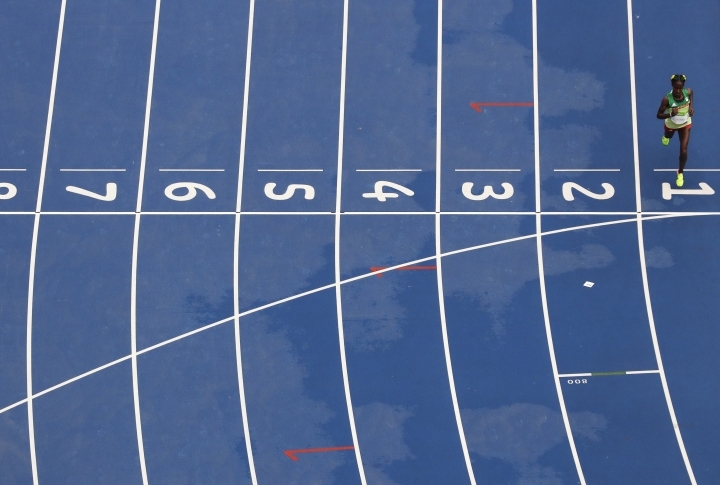 After crossing the finish line, she raised her hands in triumph and then stopped, coming to realize what she had done in only her second 10,000 at an important meet: Her time of 29 minutes, 17.45, had shaved 14.33 seconds off the 1993 mark of China's Wang Junxia. "It was not my plan," Ayana said. Once she got going, no plan was going to stop her. At age 24, she beat the best from a previous generation. Kenya's Vivian Cheruiyot, 32, a four-time long- distance world champion placed a distant second, 15.18 seconds behind. 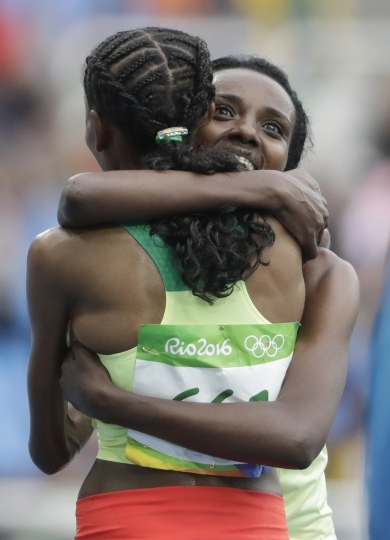 Ayana's 31-year-old teammate, Tirunesh Dibaba, took bronze. It was a bittersweet moment for Dibaba, who had been trying to become the first woman to win an individual event for three Olympics in a row. 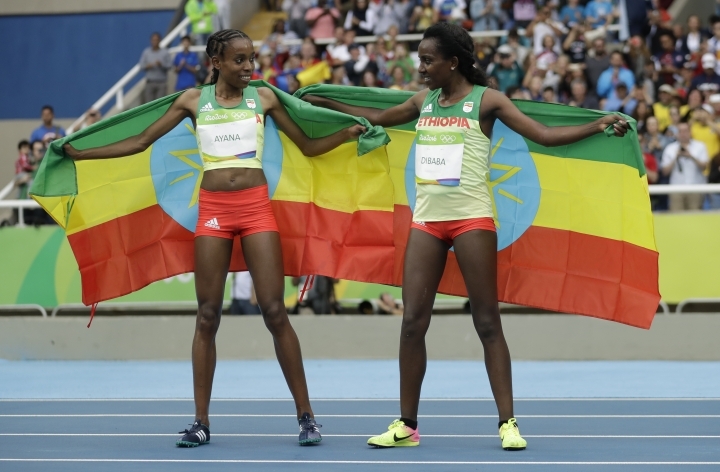 She barely stood a chance once Ayana got going, but worked to get another medal for Ethiopia. Still, she said, "I now have a bronze for my son," dedicating the medal to one-year-old Natan. 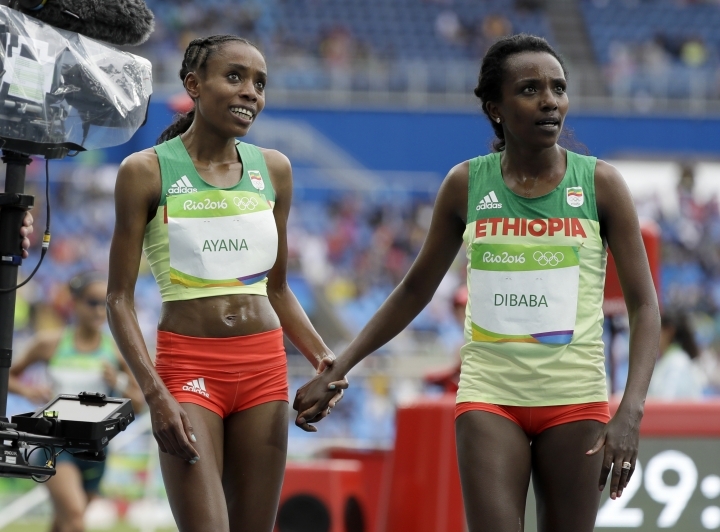 Dibaba and Ayana held hands afterward — a symbolic transition to a new era. "Running with Dibaba gave me the energy," she said. If David Rudisha of Kenya provided an iconic moment four years ago in the London Olympics with his world record in the 800, it could be tough to find a better race than Ayana's in Rio, with nine more days to go. And she has her favored 5,000 to come. She is convinced she still has enough in the tank for an encore. "For the 5,000 I prepared well, and I don't think (running the 10,000) will make any difference." In Rome this spring, Ayana went within a second of the world mark in the 5,000, even though pace setters failed to set a steady pace. Friday's conditions were ideal — cool and overcast with a damp track from morning rain. 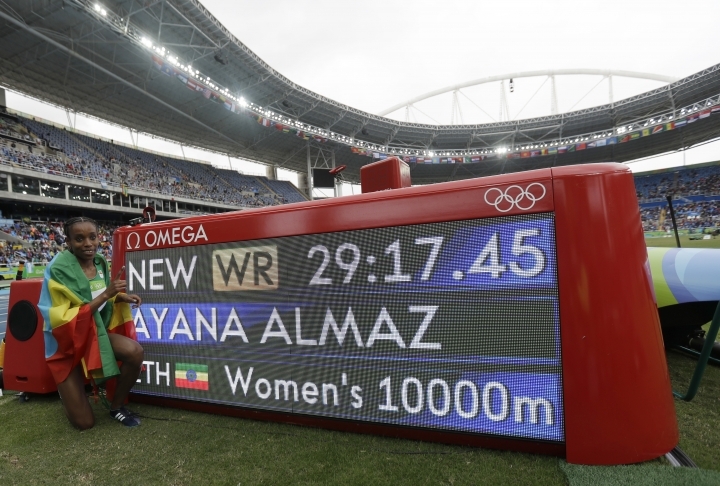 But the 60,000- capacity Olympic stadium was only a quarter full to see Ayana's accomplishment. The top 13 finishers all had milestones, with continental, national or personal records tumbling, perhaps making it one of the greatest women's long-distance races in history. Even double Olympic champion Tirunesh Dibaba had never run faster. Even though Kenya and Ethiopia are fierce rivals, it was the early strength of Alice Nawuwona that made Ayana's record run easier. The Kenyan delivered her at ideal pace at the halfway point, and Ayana put in a short sprint to sap any confidence from her rivals. Steadily, the world record became a possibility. With each lap, Ayana built a massive cushion.